Bracket Racing 101: What is It and How Does it Work? 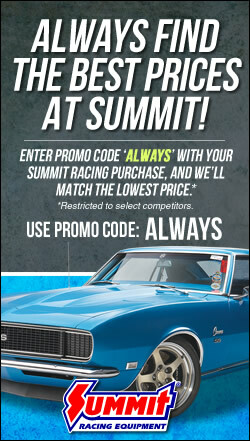 There’s no time like the present to get out and enjoy shows, cruise-ins, and races. And by enjoy the races, we mean actually go out and race. If you’ve never gone racing—or if you’ve never fully understood bracket racing—this post is intended to nudge you toward the starting line. Truth is you don’t need a lot of money or special equipment to go bracket racing—all you need is a safe car, a local track, and the desire to learn. This post will teach you the basics of bracket racing—what it is, how a race is run, how a track is set up, and more. This is an illustration of a typical quarter-mile drag race track (eighth-mile tracks are similiar). This is what a typical countdown light, or Christmas Tree, setup looks like. This is what a time slip looks like. Yeah, this big Olds 98 is the proverbial grandma car and is every bit as slow as you think it is. 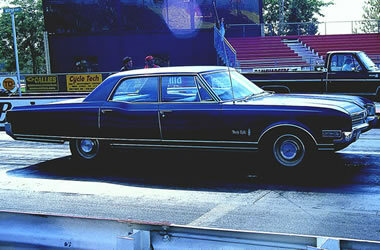 But thanks to the handicapping feature of bracket racing, you can win—and win often—in a car like this. The key to winning with a slow car is consistency. Practice your launch technique, hone your reaction times, and get your driving skills to the point where you can hit your dial-in every pass and you can clean up in the brackets. The number one temptation for a new bracket racer is to do a nasty, boil ’em-to-the-wear- indicators burnout. Word of advice: leave those burnouts to the big boys in the pro classes. 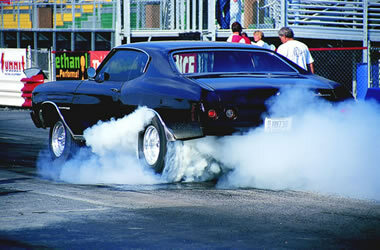 All you really need is a quick burnout to put some heat in the tires or slicks and clean any debris out of the tread. The best way to do this is to pull the car forward until the rear tires are just at the edge of the water. This will put enough water on the tread to get the tires to spin and warm up. Anything more is just a waste of perfectly good rubber. The best way to learn how bracket racing works is to watch other racers compete. Take note of how the winning drivers approach their burnout, how they stage and launch, and how they drive down the track. Don’t be shy about asking questions, either. Most racers will be happy to talk about setting up a car or their driving technique. You can use their experience to become a better racer. A bracket drag race is a straight-line acceleration contest between two cars (usually starting at different times—more on that in a minute) from a standing start over a specified distance, usually a quarter-mile or an eighth-mile. Racers line up in front of an electronic countdown device nicknamed a Christmas Tree (or just the Tree). When the cars leave the starting line, electronic timers record how long it takes each one to reach the finish line. This is called elapsed time, or ET for short. That is why bracket racing is also known as ET racing. Top speed is also recorded, but does not determine a winner in a bracket race. Burnout Box—the area just before the starting line that is sprayed down with water so you can do a quick burnout to warm up the tires or slicks for better traction and get rid of any debris lodged in them. 60-Foot Timer—Measures the time it takes the car to cross the first 60 feet of the track. This shows you how well the car launches, which affects your elapsed times. 660-Foot Timer—Measures elapsed time at the halfway point of a quarter-mile track. At some tracks, speed (in miles per hour) is also recorded. Some tracks also have timers at 330 and 1,000 foot intervals. 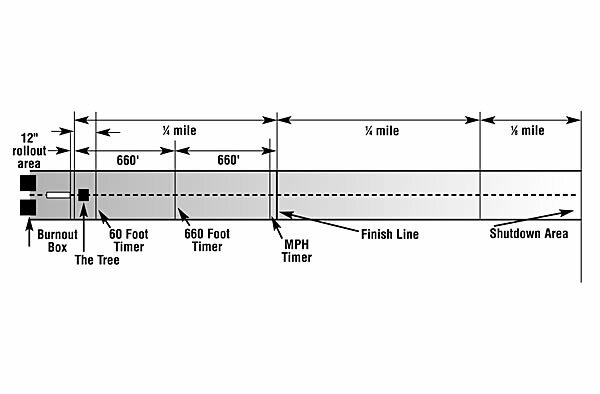 Mile-Per-Hour Timer—Also known as the speed line, this timer is located 66 feet before the finish line. It records the car’s average speed between it and the finish line. This is the mile per hour figure on your time slip. Finish Line—When you cross the light beam at the end of the quarter-mile, you stop the ET clock. The amount of time (in seconds) between when the timer was activated and when it stopped is the ET figure on the time slip. Shutdown Area—The area past the finish line, usually a quarter-mile or more in length, where you can safely slow the car down to take the turnout to the time slip booth. If something goes wrong and you can’t stop the car, most tracks have a sand trap, net, or other setup at the end of the shutdown to stop you. Pre-Stage Indicator Lights—Yellow bulbs that indicate that you are close to the starting line and should be ready to stage. 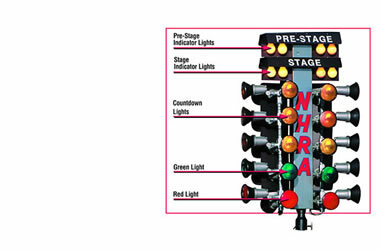 Stage Indicator Lights—Second set of yellow bulbs that indicate you are fully staged and ready to race. The bulbs are triggered when the front wheels cross a beam of light from a set of photo cells. These cells trigger the timer when the car leaves the light beam. Countdown Lights—Amber floodlights that count down to the green light. There are two types of countdowns, or starts. The .500 or Full Tree start used in bracket racing flashes one light at a time, with a .500-second difference between the last amber light and the green light. The .400 or Pro Tree for heads-up and professional classes flashes all three lights simultaneously with a .400 second difference between the amber and green lights. Typically, you want to leave when you see amber—the top bulb, middle, or last, depending on your car or class. Green Light—This is the one you’re waiting for. When it flashes, it means you’re late if you’re not moving yet! This point of the run is called the launch. Red Light—This light will flash if you break the stage beam before the green light is activated. Known as redlighting, this action automatically disqualifies you and gives the win to your opponent. This brings us to reaction time, which is how quickly a racer can get off the starting line when the light goes green. Better known as cutting a light, a quick reaction time will give you a big advantage over your opponent, especially if you are running the slower car. The starting line is where most bracket races are won or lost, so time practicing your staging and launching techniques is time well spent. 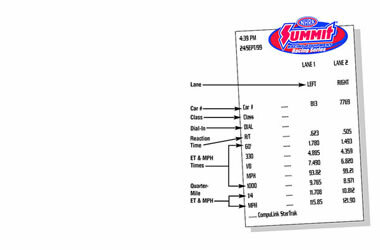 Before a bracket race can start, each car must determine what time to “dial.” To figure out an accuate dial, a racer needs to use time trials to determine the elapsed time they think their car will run. Beginning racers usually base their dial-ins on a few passes down the track. For veteran racers, a dial-in is serious business, based on years of experience and countless runs. A good bracket racer can hit on or very close to their dial-in almost every time. After you make a run, the guys in the little booth at the end of the track will hand you a piece of paper with numbers all over it. This is the time slip. It provides a wealth of information about your pass—how well you launched, how quick and fast you went at various points on the track, and your elapsed time and top speed. If you were running against an opponent, the time slip tells you how they did, too. Quarter-Mile ET and MPH—These are your final elapsed time and top speed numbers—the ones that count! Now that you have an idea on how bracket racing works, take a trip to your local track—and just watch. Pay attention to how the cars launch, how the Christmas Tree works, and what racers do in the pit area. Most importantly, ask questions. There isn’t a racer we know of who doesn’t love to talk about their car and how they approach a race. Most racers will be happy to give you pointers on improving your technique—and that will teach you volumes on how to race. After spending time watching bracket racers at work, it’s time to get your feet wet. A great way to do that is at a “test and tune” session at your local track. For a small fee, you can practice your starting line procedure, learn how the car reacts to tuning changes, and make passes down the track without the pressure of racing against someone. 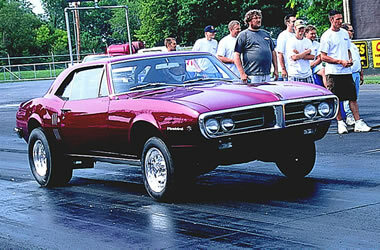 Chances are there is a drag strip within a couple hours’ drive. Most tracks are sanctioned by the National Hot Rod Association (NHRA) or the International Hot Rod Association (IHRA); you can locate a track near you by visiting their websites. We hope this primer helps you understand the basics of bracket racing. One thing we will guarantee: once you make that first run down the track, you’ll be hooked for life! Author: Alan Rebescher Editor, author, PR man—Alan Rebescher has done it all in a 25 year career in the high performance industry. He has written and photographed many feature stories and tech articles for Summit Racing and various magazines including Hot Rod, Car Craft, and Popular Hot Rodding, and edited Summit Racing’s Street & Strip magazine in the 1990s. His garage is currently occupied by a 1965 Ford Mustang. You forgot to remind us how much fun it can be!!!! What purpose does it serve to have a head start equal to the difference between the dial-ins, since winner is based on ET and dial-in? So reaction time has no effect on bracket racing? Bracket racing is all about having the best package. This write up is a very vague intro to bracket racing. Example: you dial 7.00 seconds and run 7.005 with a .520 light with .500 being perfect you have a .025 package. I however dial 6.00 seconds and run 6.002 with a .518 light I have a better .020 package and take the win by .005. Hope this helps. So if you are only try to get close to your dial, in theory you can just put in like 1 minute and then creep down the track with a watch and make sure you hit exactly 1 minute and then win. Why do cars have to be fast if you are only try to get your dial ??? Do I miss something. ?? NeRly all tracks. Limit the slowest cars to 25 seconds. In the 1/4 mile. So as not to delay the days events and so the the faster car that you maybe racing. Is not forced to wait. An ex ordinary amount possibly causing that car to over heat or experience other mechanical issues. As in early posts. Your over all reaction to the lights and how close you predicted the car to run plays into the whole race. Some tracks use .000. Others use .500 as a perfect light. Depends on the computer programs that track uses. .000 is easier to understand. For new racers. The closer to a perfect light. And the closer to your ET. The better chance of you winning the race. The further from perfect or a slower reaction and the less accurate to predict the ET. The less chance you have of winning. If your new to a class or new to a track. You may not know many people there and won’t lnow how those same people may drive and react to the track conditions. Making your. Predictions even more critical. But as a new racer it is best to talk with the staff and get help to understand. The how to and why’s. Plus bend the ears of the locals. We live to share our knowledge and experience. To help you become successful and enjoy the sport more.